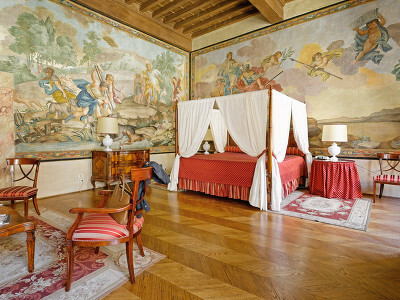 The 10 en-suite rooms and suites at Palazzo Niccolini are large with painted ceilings and frescoed walls in true Italian style. All rooms are air-conditioned and most of the spacious bathrooms are marble. The three Standard Double rooms, sleeping two, are fitted with double or twin beds and equipped with all the comforts. Bathrooms are marble and luxuriously appointed. The three Deluxe Double rooms, sleeping up to three, are large and fitted with double or two single beds, and all the modern comforts. The marble bathrooms are luxuriously appointed. Additional cotbeds available on request. The two Junior Suites, sleeping up to four, have walls decorated with original frescoes or stuccos, a canopy kingsize bed and sofa bed, or double bed. The marble bedrooms are luxuriously appointed. 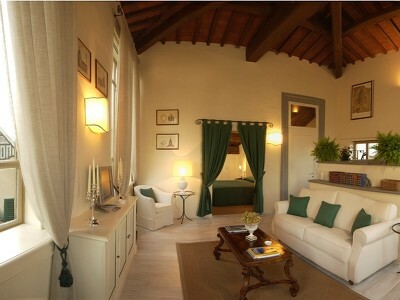 The three large Suites, sleeping up to five, overlook the private courtyard or the Duomo. In addition to a kingsize bed, they feature a sofa bed that can accommodate two. The marble bathrooms are luxuriously appointed. Additional cotbeds available on request. The two large Deluxe suites, sleeping up to four, offer spectacular views of the Duomo; frescoes or Jacuzzi bath and an additional sofa bed that can accommodate two people. The marble bathrooms are luxuriously appointed. Additional cotbeds available on request. 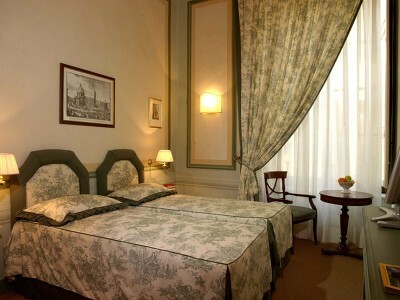 You couldn't find a luxury hotel closer to the Duomo in Florence than Palazzo Niccolini if you tried! Owners Filippo and Ginevra Niccolini di Camugliano, members of one of the city's older families, have recently renovated the Palazzo transforming it into one of the loveliest historical boutique hotels in the centre of Florence. The area surrounding the Duomo has become a pedestrian zone making it one of the quietest and cleanest locations in the city. 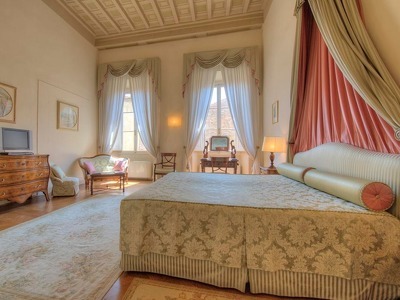 Palazzo Niccolini welcomes families, and pets are permitted to stay too, by prior arrangement. Massages and treatments can be arranged in your room on request. Private drivers can be organised for shopping trips or excursions to nearby towns and places of interest. The concierge service are more than happy to set up private tours of some of Florence's finest museums and art galleries. There is so much to see and do right on your doorstep and it is a real treat being able to step right onto the Duomo square. There's a restaurant on the ground floor of the hotel, offering fine Tuscan cooking and wine. Room service is also provided up until 9 pm. Additionally, pastries, tea and coffee are available in the sitting room each day from 2 pm, as is an honesty bar. When arriving by car in central Florence, you will find a bollard blocking your way when you turn left from Via de Pucci into Via Ricasoli. Call #800 283 060 (Police) to lower it (guests are allowed to enter). The nearest airport is Florence Amerigo Vespucci Airport Airport, a 20-minute drive (Approximately 4km distance). A deposit of 15% will be taken at the time of booking. If a cancellation is made more than 7 days prior to arrival, there will be no charge. If a cancellation is made within 7-4 days of arrival, the total price of the first night will be charged. If a cancellation is made within 3 days of arrival, or in the event of a no-show, 100% of the total price will be charged. - for cancellation from 3 days prior to the arrival date and for no-shows, the total stay will be charged. 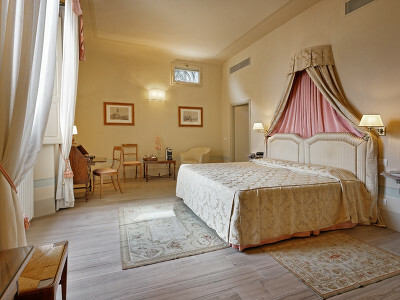 The pictures of the rooms/suites were beautiful on the Palazzo Niccolini website, but after we checked in we realized that the accommodations and the entire property is fabulous! Without exaggerating, everything is much, much better than what the pictures depict. Every aspect of our stay far surpasses any other property I have stayed in. Mrs. Niccolini was very attentive and gracious, and the palace offers every imaginable service. The staff as well is amazing, and all while making us and all the guest feel special and welcomed. Almost everything life is relative, so please consider my reasoning; I HAVE BEEN FLYING FOR THE LARGEST AIRLINE IN THE WORLD FOR 42 YEARS AS FLIGHT CREW. 41 of those years on international flights all over Europe, Central and South America, Asia, etc. I highly recommend the Palazzo Niccolini al Duomo! We LOVED this hotel! Beautiful room and very conveniently located. Also the staff was amazing - so helpful with all of our requests. Also a great breakfast in an elegant setting. I don't want to leave. We won't ever forget our stay at Palazzo Niccolini, and I expect no other hotel experience will ever eclipse this one. The service, breakfast, and parking in the palazzo courtyard were to the same level, and I can't say enough positive things about this experience. We hope to return soon. Without doubt the best hotel staff I have ever seen! The hotel is an old world gem, well maintained and lovely. Location was great also near the best museums and restaurants.5 stars in my and my familys opinion!